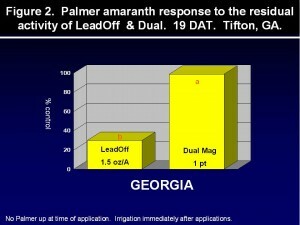 LeadOff herbicide for residual Palmer amaranth control…..not so fast!!!! 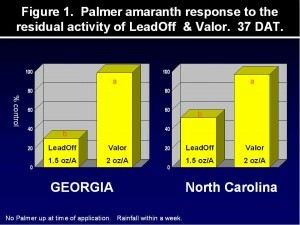 LeadOff herbicide for residual Palmer amaranth control…….not so fast! (Culpepper, Prostko, York). LeadOff (rimsulfuron + thifensulfuron), a fairly new burndown herbicide for several agronomic crops, is an excellent tool for controlling numerous winter annual weeds such as chickweed, geranium, groundsel, henbit, and many more. Unfortunately, some have touted LeadOff as a great residual Palmer amaranth herbicide and have even suggested LeadOff could actually replace Valor for residual control in a cotton burndown. These suggestions are as far from the truth as one can get (Figures 1 and 2). Growers are strongly encouraged to use the products and programs that have proven effective when managing Palmer; those including Valor and/or diuron. In Georgia, cotton programs can be found at www.gaweed.com. As always, follow all plant-back restriction intervals for burndown herbicides. This entry was posted in Cotton Production, Weed Management. Bookmark the permalink.